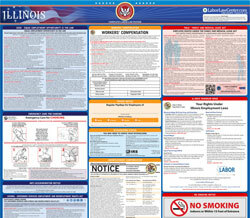 The Workers' Compensation is a workers compensation law poster by the Illinois Department Of Labor. This is a mandatory posting for all employers in Illinois, and businesses who fail to comply may be subject to fines or sanctions. This poster must be posted in a conspicuous place where all employees will see it. This poster describes the rights that employees have to get compensation when they get injured on the job, the steps that must be taken by the employee should they get injured on the job including the time limit of filing a claim. It appears you don't have a PDF plugin for this browser. Please see the link below to download illinois-icpnform.pdf. by work. Benefits are paid regardless of fault. as one of your two choices of providers. ase call the Commission or go to the Web site. claim, you may be penalized under the law. similar diseases have special requirements. settlements approved by the Commission are binding. IN EACH WORKPLACE AN D COMPLETE THE INFORMATION BELOW. ICPN 10/11    Printed by the authority of the State of Illinois.